The CHANGES project was completed by January 2015. The final report can be dowloaded here. The CHANGES network (Changing Hydro-meteorological Risks – as Analyzed by a New Generation of European Scientists) aimed to develop an advanced understanding of how global changes (related to environmental and climate change as well as socio-economical change) will affect the temporal and spatial patterns of hydro-meteorological hazards and associated risks in Europe; how these changes can be assessed, modelled, and incorporated in sustainable risk management strategies, focusing on spatial planning, emergency preparedness and risk communication. The MCITN was inter-disciplinary and inter-sectoral by its nature. Active stakeholders’ participation and the dissemination of the project results were important features of the project. High-level training facilities as well as scientific and technological excellence were provided to the next generation of researchers in the field of hazard and risk management. The results of the CHANGES network contributed to the Topical Action numbers 2 and 3 of the Hyogo Framework for Action of the UN-ISDR, as risk assessment and management, combined with innovation and education are considered essential to confront the impacts of future environmental changes. (1) provide high-level training, teaching and research in the field of hazard and risk management in a changing environmental context to European young scientists. (3) to develop a methodological framework combined with modeling tools for probabilistic multi-hazard risk assessment taking into account changes in hazard scenarios (related to climate change) and exposed elements at risk. The network consisted of 11 full partners from the Netherlands, Germany, France, Switzerland, Austria, Poland, Romania and Italy and 6 associate partners of which 5 private companies, from the UK, Spain, Netherlands, Germany, and Italy. The network employed a total of 17 Early Stage Researchers, of which 13 were female and 4 male. The ESRs came from all over the world: New Zealand, Germany, Belgium, Slovenia, Romania, Netherlands, Italy, Myanmar, Colombia, USA, Switzerland, Macedonia, China, Iran, Moldova and Argentina. Twelve ESRs were hired for a period of 36 months, and carried out PhD research, whereas the other five ESRs were hired for 18 months and worked on the development of a web-based spatial decision support system for the analysis of changing risk. All ESRs have spent a considerable amount of time with other partners in secondments. The scientific focus of the project was on a number of topics organized in five themes (work packages). The main objective of the first theme was to analyse the changes in hydro-meteorological hazards that are expected as a result of environmental changes. These changes are related to climate change and to expected changes in land use/land cover and ecosystems. 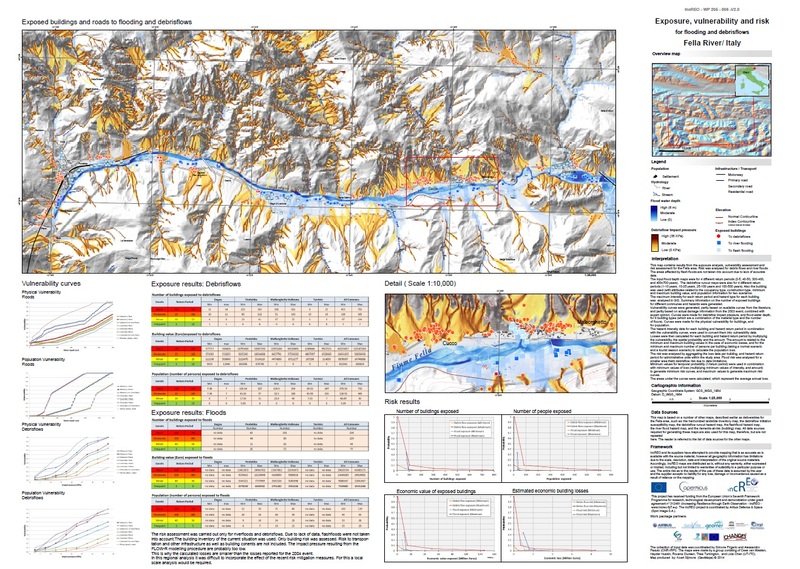 Regional and local scale probabilistic hazard assessments for floods, landslides and debris flows were developed for four case study sites (Barcelonnette / Ubaye Valley in France; Buzau County in Romania; Fella River in Italy; and Wieprzówka catchment in Poland). Information on rainfall triggers were analysed and threshold models for landslide and flood occurrence were established. Downscaling of regional climate models was carried out to find out the most predictive factors for hydro-meteorological events. These data were used for further analysis of the relationships among triggers and slope/catchment responses in order to simulate the future trends in the occurrence of the hazards according to forecasted climate/landcover changes. The aim of the second theme was to evaluate environmental changes, triggered by global change (including climate change) and interacting with economic development, leading to changes in exposed elements at risk. The assessment of former distributions and the characterization and analysis of the current exposed elements at risk formed the basis of the work. Future scenarios for the location and type of exposed elements at risk depend on a number of factors, which are related to global change, but also to future economic developments and implementation of policies for land use planning. The uncertainty level in vulnerability approaches was evaluated based on historical damage catalogues, modelling and expert opinion. Indices for comprehensive, or holistic vulnerability assessment that include uncertainty levels were also be analysed and integrated within a dynamic context, focusing on characterization of future changes. The aim of theme was to integrate the techniques for hazard assessment with the results of the exposure and vulnerability analysis, into a platform for Quantitative Risk Assessment (QRA) using multi-hazard risk assessment techniques. An important component consisted of the formalization and organization of datasets that can be used for the risk assessment models as well as for integrated risk management. The other theme focused on obtaining an advanced understanding on temporal and spatial patterns of hydro-meteorological hazards and associated risks in sustainable risk management strategies, focusing on spatial planning and emergency preparedness, response and rescue activities. Starting from the findings from th other themes optimal methodologies, instruments and tools for risk management were designed and applied in order to cover the whole disaster cycle, also considering the complexity of changing environments. The outcomes were used for risk communication purposes, achieved by designing specific risk visualization and communication tools, aimed at local authorities, planning agencies, civil protection organizations, and also with a component directed to the general public. All partners and all young researchers within the Changes project were aware of the importance of stakeholder involvement in the evaluation of changing hydro-meteorological risk and its consequences for Risk Management. The network organized a large series of training events in which also participants from outside of the network were invited. This resulted in a total of 6 professional skill courses (Research work plan development and scientific writing, Research ethics, Valorisation of scientific results, Dissemination of scientific results to the public, Writing research grant proposals and Project management), 6 technical skills course (Probabilistic risk assessment, Multi-hazard risk assessment, Monitoring and prediction of environmental changes, Web-GIS and Spatial Data Infrastructure, Tools for risk Management and Use of risk information in Spatial Planning) and 5 topical workshops (Risk governance implications of changing risks, Environmental changes, Modelling changes in hazard and risk, Changes in Risk Management and development of a Web-based platform). Within the framework of the EU FP7 Marie Curie Project CHANGES (www.changes-itn.eu) and the EU FP7 Copernicus project INCREO (http://www.increo-fp7.eu) a spatial decision support system was developed with the aim to analyse the effect of risk reduction planning alternatives on reducing the risk now and in the future, and support decision makers in selecting the best alternatives. The Spatial Decision Support System is composed of a number of integrated modules. The International Conference on the Analysis and Management of Changing Risk for Natural Hazards was organized to present and discuss research results in the above mentioned fields. 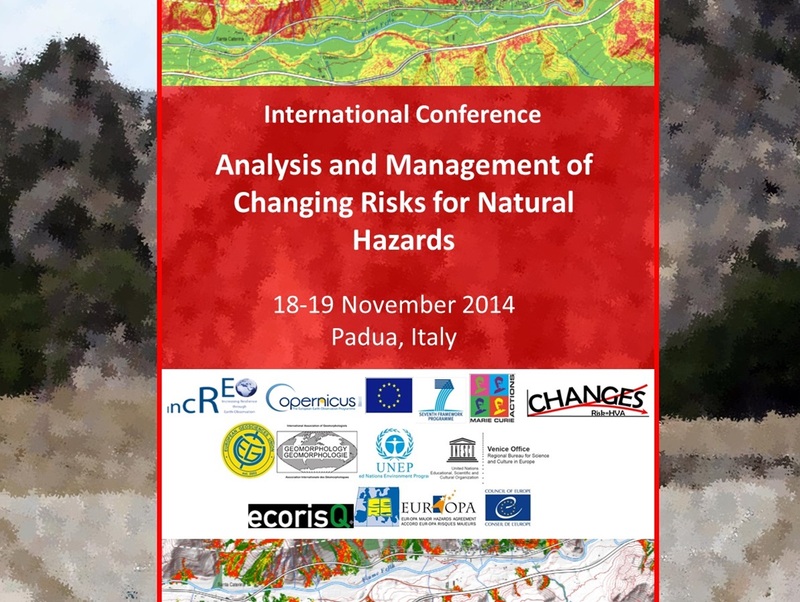 The conference was held on 18 and 19 November, in Padua, Italy. The conference provided an opportunity to discuss multi-hazard risks and multi-disciplinary research results on the effects of changing hydro-meteorological risks and their effects on planning strategies. The conference focus was.s put both 1) on technical sessions presenting the state of the art research in the understanding of the natural processes and in the development of innovative methodologies for quantitative hazard and risk forecasts, and 2) on the practical integration of natural, engineering, economical and human sciences within multi-scale methodologies for risk management and prevention planning. The conference was attended by 170 participants, from 34 countries. There were 46 oral presentations and 62 posters. See the extended abstracts here. A dissemination workshop with the stakeholders in the Fella area was organized 20 November 2014. This was an earlier FP6 Marie Curie ITN. Its focus was research and training in all aspects of mountains hazards and risks asses sment and management. This European network developed an advanced understanding of how mountain hydro-geomorphological processes behave and to applied this understanding to living with the hazards in the long-term. Several of the partners in CHANGES have also collaborated in this project. Living with landslide risk in Europe: Assessment, effects of global change, and risk management strategies. SafeLand will develop and implement an integrated and comprehensive approach to help guide decision-making. The methodologies developed will be tested in selected hazard and risk "hotspots” in Europe, in turn improving knowledge, methodologies and integration strategies for the management of landslide risk. This FP7 project aims at developing a culture of risk prevention by evaluating the benefits of different risk prevention initiatives. This evaluation will be carried out by developing a novel methodology and referring to different types of water-related catastrophes, such as river inundations, urban flash floods, storm surges, rainfall triggered debris flows and landslides. The objective of IncREO is to provide actors responsible for civil protection and disaster management with EO-based solutions contributing to an improved preparedness and mitigation planning for areas highly vulnerable to natural disasters and already noticeable climate change trends. Documentary made by Romanian national TV in Buzau county, Romania, of a meeting of the CHANGES network. Newspaper article (in French) about a CHANGES meeting in Barcelonnette. Newspaper article (in Polish) about the stakeholder meeting in the study area. Newspaper article (in French) about the work done by one of the ESRs in Barcelonnette. Download the CHANGES project brochure.